Artificial intelligence (AI) brings the new wave of automation. It changes every business as electricity did a few years ago. Things become smarter and every business is looking for ways to put machine learning into production to bring value to customers. Everyone wants to incorporate that intelligence into their product. But, where to start? Let's take a step back and think about basic human-tool interaction. We use products to enhance our own capabilities, become more effective, nicer, and better people. We are hiring products to do our tasks. Remember the last time you were at a party, and wanted to go home? That need was the same for the people living 100 years ago. The difference is that now you have more options to do that. Technology is working for us, and we are good at hiring it. Products are constantly changing, human needs remain the same. Intercom previously introduced a framework called Job Stories. It's a creative framework to help frame and capture human needs so that you can work with it later in the development process. It has its own pros and cons yet, I find it the most effective way to think about AI automation. While its focusing on targeting human needs, it opens the space for possible technological solutions. And this is exactly the space of AI disruption. Try to write down the job story of your product. What job does your product help people to accomplish? One product could cover multiple job stories. Somebody gets a car to save commute time, so they can spend more time with their families while others enjoy racing through the country during the weekends. People are going to use your product it to fulfil their needs. Talk to the people and understand for what jobs are they using your product, before designing solutions. Computers can now understand audio, can see and tell what's in the pictures which allows it to do more complex jobs previously only exclusive to humans. In other words, computers can do more complex and harder jobs. Knowing what jobs that your customers hiring for, you can start a discussion about possible solutions the ML can bring to the table. Draw 2 axis. 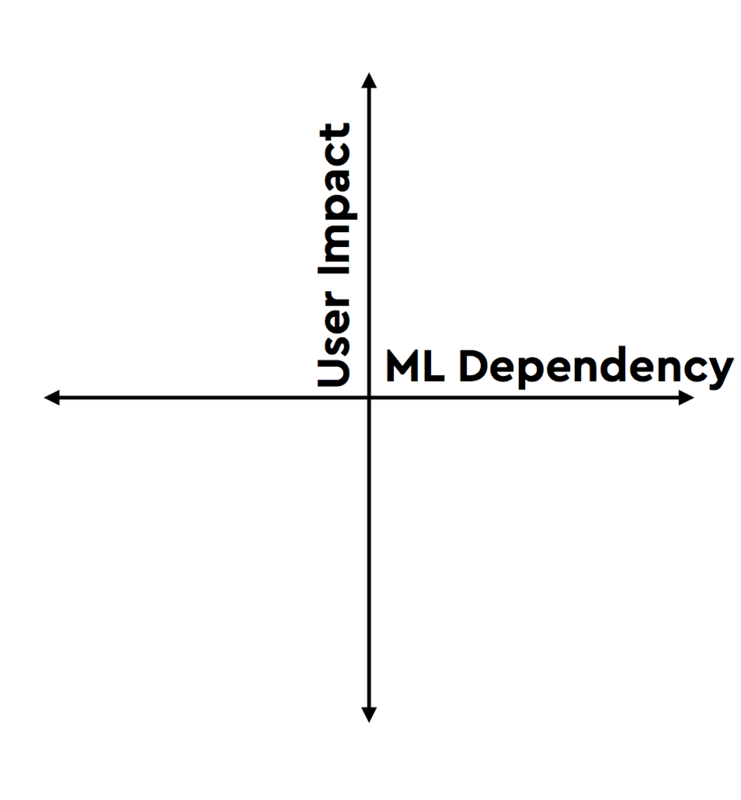 The impact it have on the User Impact, and Machine Learning (ML) dependency. Let's take a look at solutions we did for the educational application. Our goal was to find core functionality for the product using ML to deliver core value of the app. Since the product has not history we formed hypothetical job stories. Using hypothetical scenarios you can start working right now and look for the validation on the way. If you are willing to get it right, use some of the research techniques to validate your job stories before doing so. Put the job story you want to focus into centre and write down all ideas on possible solutions. Now go through all possible solutions targeting this job, discuss it and place it on the matrix. After few repetitions you can get something like this. While doing so we found 2 surprising things. The solution we wanted to build fell into fourth quadrant. 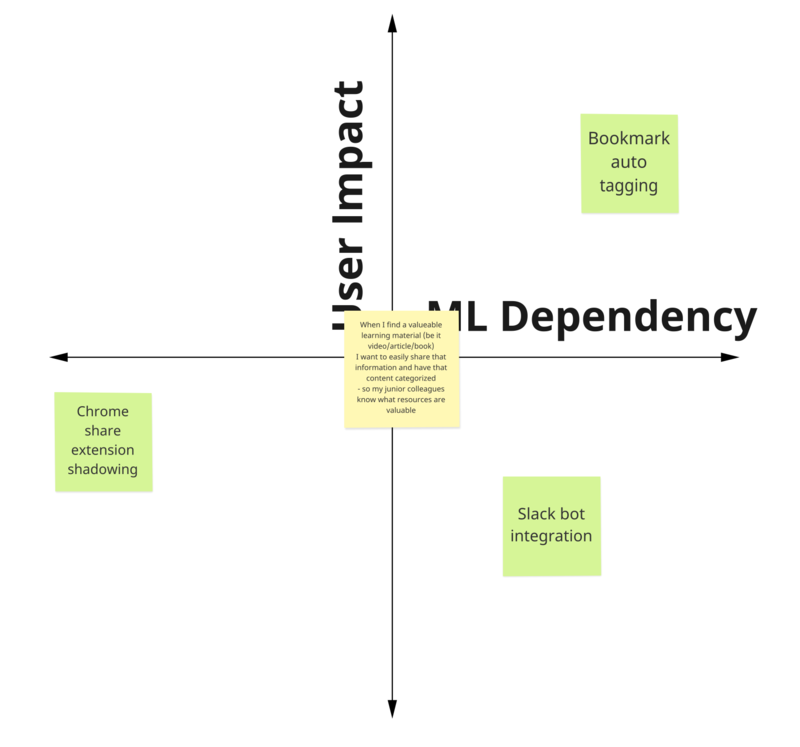 That area of low user impact and low ML dependency is a no-go as the core feature of your app. Also, we discovered a new solution in the second quadrant, which we hadn't thought of before. When looking to use ML as your core product functionality, that's your spot. Repeat with more solutions and job stories, until you have found the right solution you want to build. Using this method you can help frame an early discussion with ML engineers and narrow down value discovery discussion. It is also helpful to declutter discussion about cost heavy machine learning solutions, and discovering easy-to-implement alternatives. Share your thoughts in the comments.